The fan tail on the Lunar Models kits has a swoop instead of a step. The culprit is removed. 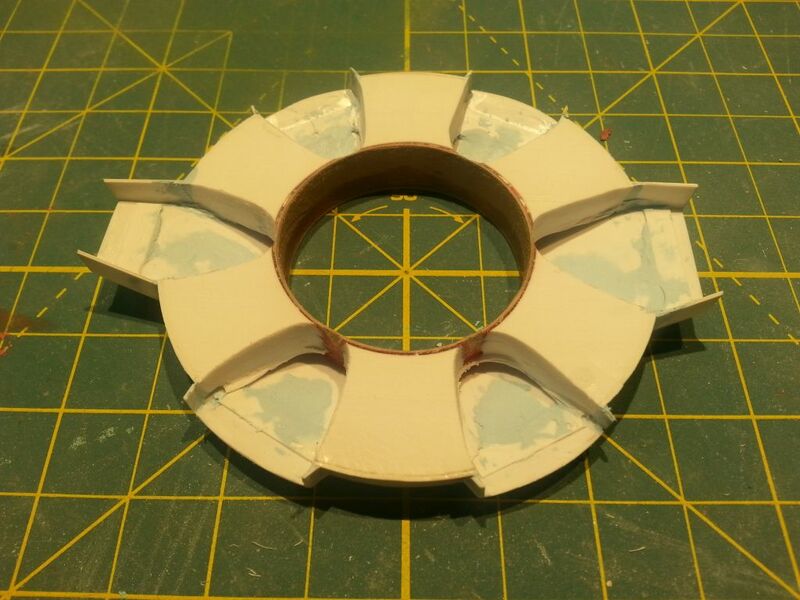 To ease gluing in the corrected plating, sheet styrene tabs age glued into place to aide assembly. New plates added and filled. 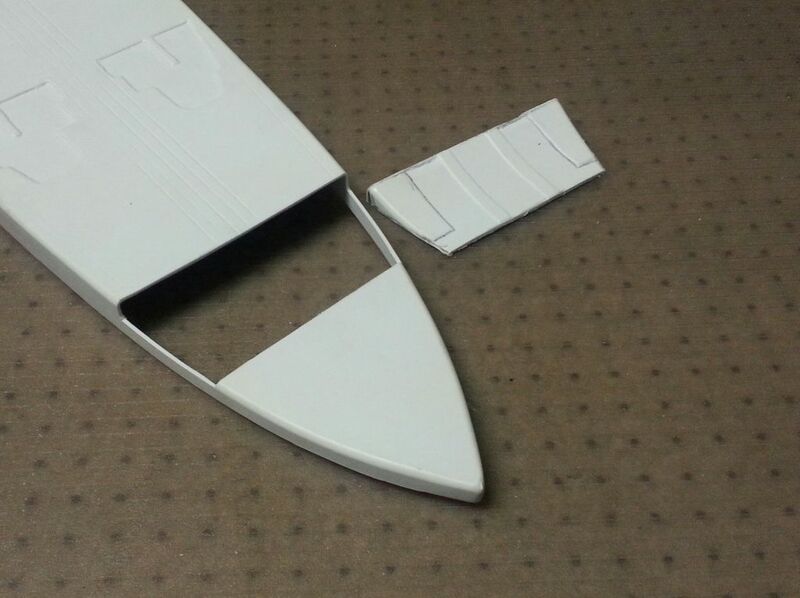 To determine the correct shape of the bow, I zoomed in on images of the studio model till it match the same size as the kit. I then made paper templates to help make the corrected bow shape. 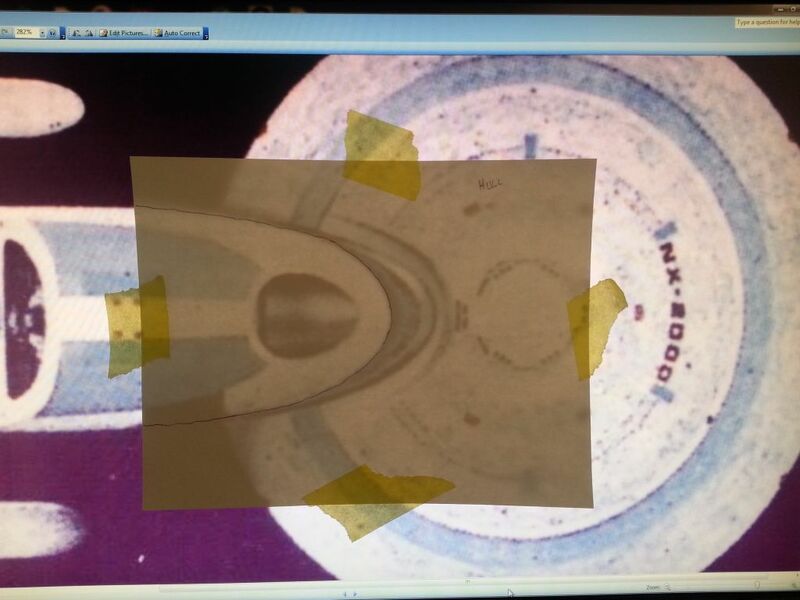 Re-enforcement was added to correct some warp and shape issues with the kit part. 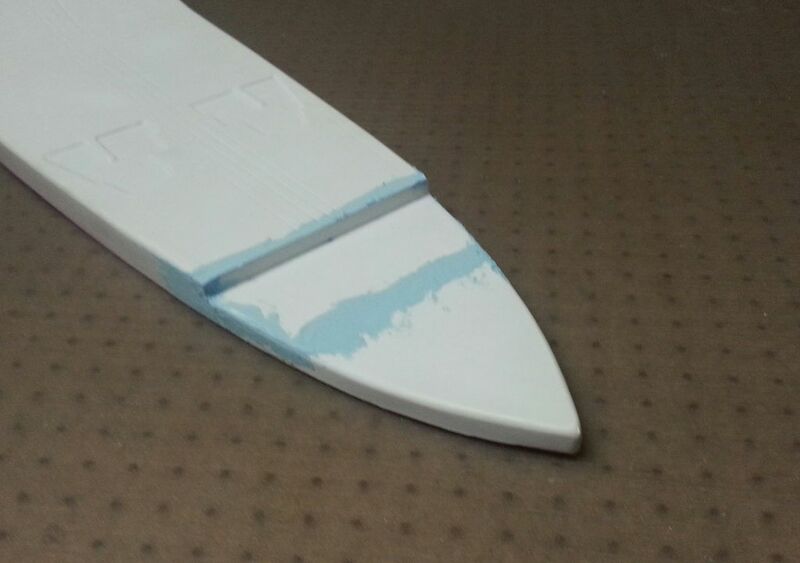 With the top hull plate glued into place, the shape issue is quite noticeable. 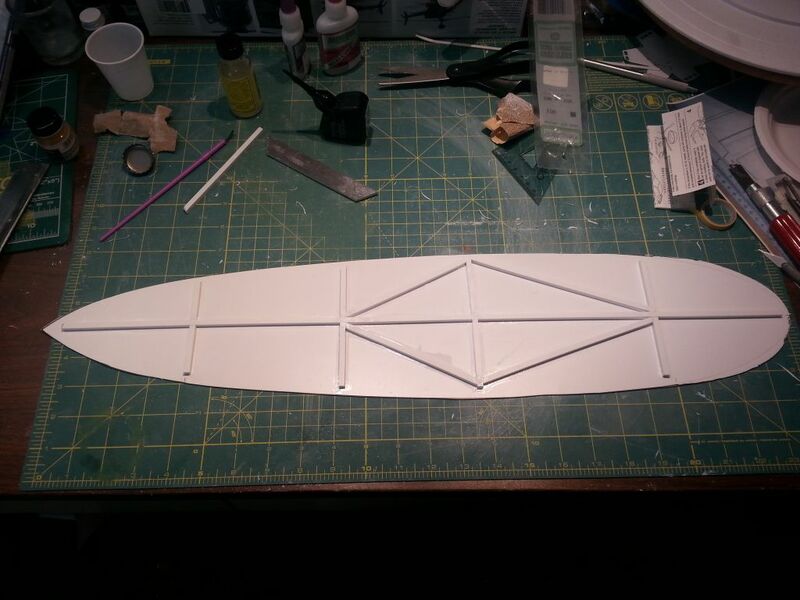 Using Aves Apoxie Scultp, I fashioned in the new shape of the secondary hull's bow. Next will be to fill in any flaws, sand smooth and prime. 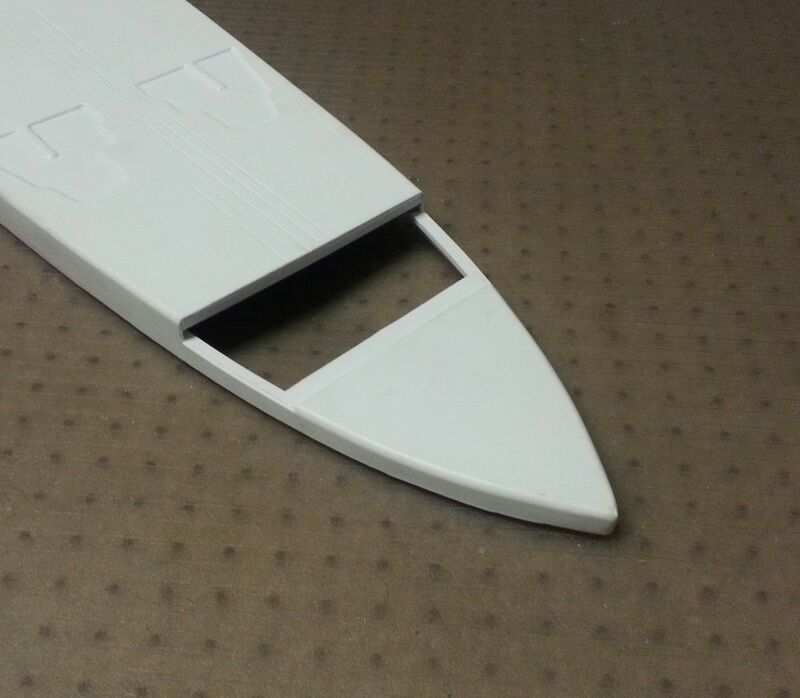 The new shape will be used to vacuum form a whole new secondary hull in clear for lighting. I nearly bought one of these but was put off by the amount of work needed and my skills would need one mega learning curve - damn man - you make it look easy! This is brilliant stuff and I'm blown away by your deatailing and scratchbuilding kung fu! This is going to be a thing of beauty to be sure when it's done. Will be following this baby. Thanks for the kind words. I think it's the best, and funniest compliment I've ever gotten in regards to my work. Thanks a bunch - it made my day! You are right about this kit. Just doing it out-of-box like my first build was a LOT of work. That first build got me a job offer to work for a studio that had contracts with MGM/Universal studios in Orlando because of what this guy saw in its construction. He had stopped by the local hobby shop where I had it on display. He knew this kit, left me his card with a note to call him with the shop owner and offered me a job right over the phone. I couldn't take his kind offer at the time because I was still flying jets for Uncle Sam's Navy, and was getting ready to do a another deployment. Other than flying in the Navy, and now for American, it was one of the proudest days of my life. I'm really enjoying this project. I was motivated by old friend Sean Sides' work on his studio scale rag-tag BSG fleet after helping him move it during the IPMS Nats in Denver. It made me decided to get off my arse. It's slow going because in my line of work, I'm home only 3 days out of the week. It may be a blessing in disguise though. When I'm on the road away from my hobby room, I can think about the next steps ahead and not be rushed. So my next move on the model when I get home is a decisive one. It's slow going because in my line of work, I'm home only 3 days out of the week. It may be a blessing in disguise though. When I'm on the road away from my hobby room, I can think about the next steps ahead and not be rushed. So my next move on the model when I get home is a decisive one. Same thing I do---even though I'm not a Pilot. And folks wonder why it takes me 6 months or more to build a kit. 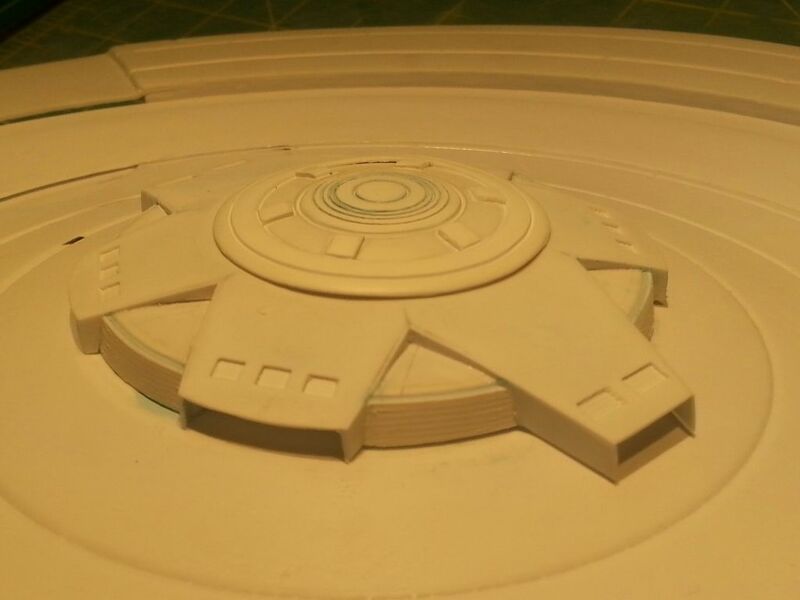 Just about ready for its first coat of primer, then I'm sure a few putty-sand-primer sessions after that to make sure it's ready for the vacuum-form machine. Off on a 4-day trip starting tomorrow. Last edited by Vidar710; 12-02-2013 at 04:58 PM. Can't wait to see her vac'd up---be safe! Still some work to do to clean it up before it's ready to vacu-form. 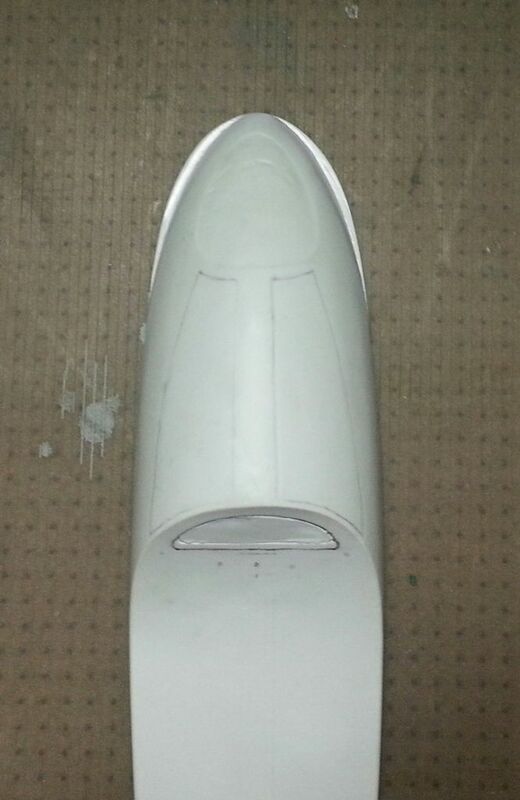 Another round of filler on the secondary hull.. It has all ready been re-primed. 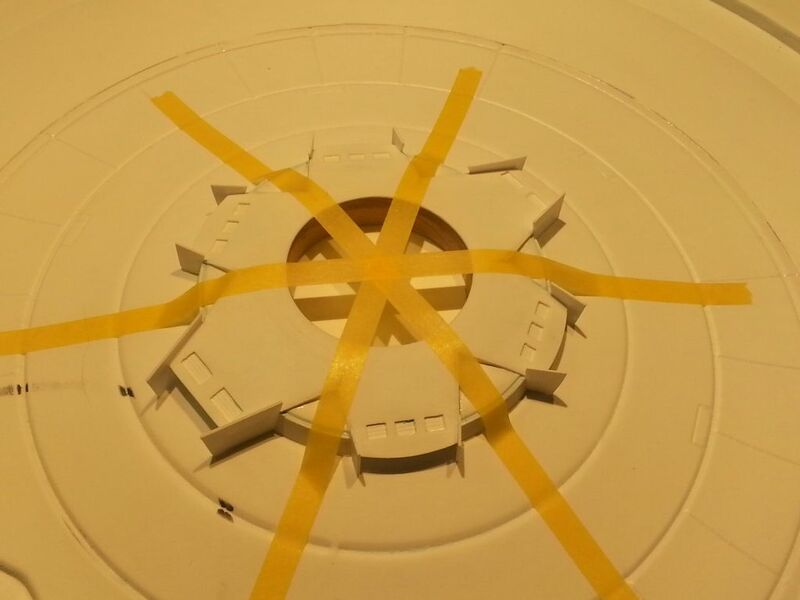 To start wrapping up the Planetary Sensor Dome assembly, I tapped it in place to allow the walls to be glued into place properly and follow the contour of the saucer. I made them over-sized for ease of placement while gluing. The excess is trimmed away and sanded smooth. The light trenched are smoothed out to match the profile of each spot light patrician. 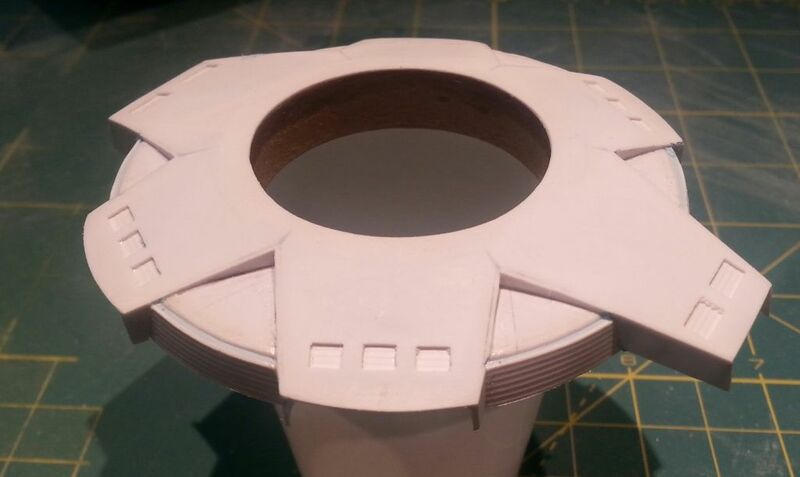 After some repair to some flaws, the entire Planetary Sensor Dome assembly is placed to check the fit. It's still not quite done. That sensor dome is just gorgeous Tracy. Quite a piece of engineering. The secondary hull is an inch and a half too long making the aft step in the hull an inch too far aft. Gonna sleep on it and decide if it's worth the effort to chop off 6" to fix 1.5". All depends----if you don't mind some knucklehead posting something like, "Hey, that secondary hull doesn't look right....."
Nevermind the end product will be spectacular---that's all he'll focus on! If it drives "you" nuts (that's what's important), then I'd fix it. My opinion? You've noticed it in time to fix it. If you don't, it'll probably bug you. ^^^ What that guy said. What's-his-face is right. I know it would bug me.